Scotland's rural economy secretary has written to the UK government urging it to confirm it will cover all of the agricultural funding currently provided under the EU after Brexit. Fergus Ewing has asked Secretary of State Michael Gove for clarification. Mr Ewing said farmers are facing uncertainty because of the lack of guarantees. The UK government has said the total of cash support for the sector would be maintained until 2022. In an open letter to Mr Gove, Mr Ewing said: "As I have explained to you previously, many of the sectors that this funding supports require long term planning - from farmers planning their crop rotations and forecasting the number of cattle or lambs they need to produce for a market in a year's time; to the forestry industry ensuring sufficient saplings are available for planting in coming years; to rural communities investing in businesses to make them more viable and help prevent rural depopulation. "If the UK government is unable to provide this confirmation (over funding), I would be grateful for an explanation as to why this is not possible, and when the UK government does in fact expect to be able to give clarity on this point." 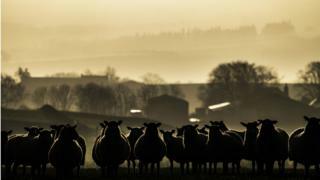 A Department for Environment, Food and Rural Affairs (Defra) spokesman said: "We have already confirmed that we will maintain the same cash total funding for the sector until 2022 - this includes all EU and Exchequer funding provided for farm support under both Pillar 1 and Pillar 2 of the current CAP. "This is a clear demonstration of our ongoing support for the farming sector as we leave the EU, providing them with further security on future funding than our European neighbours." Defra has said it would pay direct payments for 2019 on the same basis as for 2018. In a statement, it added: "We also plan to allocate the money paid in direct payments for 2020 in much the same way that we do now. "Farmers will then be supported over a seven year transition period from 2021 - 2028 as we leave the CAP."